Whether you get blood stains on clothes, furniture, carpets, or another area of your home, it can be distressing to see a continual reminder of an accident. Depending on the amount of blood and how long it had to soak in, you may be able to remove it with one or more of the tips that we outline below. The first thing to do when blood has splattered onto clothes is to remove them and soak them in cold water. Next, you can pre-treat the garment by placing liquid detergent into the cold water and allowing it to sit for up to five minutes. You may need to push down on the item of clothing with one hand to ensure that it remains fully under water. You are ready at this point to wash the blood-stained clothing with other clothing items or sheets and towels. The other items you wash with the pre-treated clothing should be as close to its color as possible. There is no need to rinse the water or detergent off the piece of clothing with the blood stain before you put it in the wash machine with the rest of the items. Run a load of clothes through the wash machine as you normally would but make sure the dial is set to cold water. Unfortunately, using warm or hot water will cause the stain to set into the clothing rather than remove it. If the bloodstain does not come out completely when the load has gone through a drying cycle, you can try to repeat the same process. You may need to hire a maid service if you do not want to do this yourself. If your child had a nose bleed while sitting on the sofa or your cat got a claw stuck and left a little blood behind, you might think the stains are impossible to remove. While some will be difficult to get rid of entirely, others will come up with the right combination of elbow grease and cleaning product. Keep in mind that blood is always easier to clean up when it is fresh and has not yet had the opportunity to dry and harden on the surface of your furniture. Many home goods, discount, and online stores sell cleaning products designed only for removing blood stains. These products work by making the properties of the stain water-soluble so you can simply wipe it up. At Companion Maids, we encourage you to research several blood removal cleaning products and to read the reviews about each product. With so many options available, it really becomes a matter of preference as to which one you will buy. You can even use a magic eraser. Pour hydrogen peroxide on the blood stain. This is a common trick in the medical and veterinary fields. Spray window cleaner on the blood stain before you attempt to wash the fabric. You will need a cloth to rub the window cleaner gently into the stain. If the fabrics of your furniture are washable, try pouring salt water on the blood-stained area. For removable pieces of furniture such as couch cushions, place several inches of water in the bathtub and then add a denture cleaning tablet. The blood-stained item can remain in the bucket for up to one hour before you remove it and wash it by hand. Try rubbing lava soap on the stain and then return in three hours to see if the stain is gone. The first step in getting blood out of carpet is to saturate the area with cold water. After allowing the cold water to sit for several minutes, try to blot out the stain with a clean rag. Be sure not to use a wiping motion since this will spread the stain rather than remove it. A wet/dry vacuum cleaner can also work on a blood stain that has not set in yet. As an alternative to water, you can try using a tablespoon of ammonia and the same blotting process. 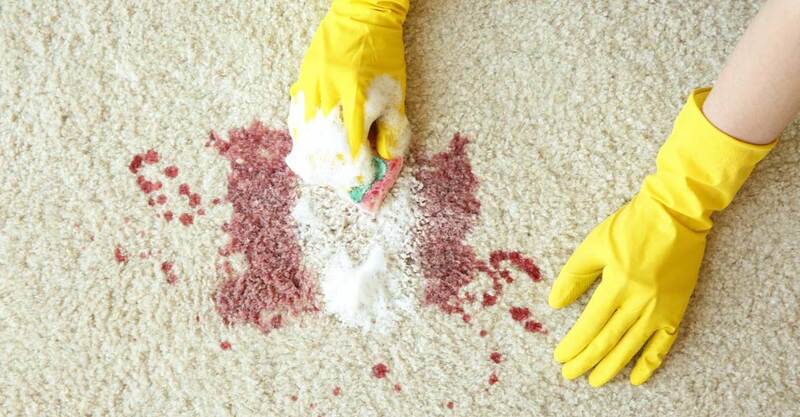 You may need to buy a carpet cleaner if neither of the above methods is effective at removing a blood stain. Be sure to follow the instructions on the back of the can, which will likely call for you to sprinkle some cleaning product onto your carpet, allow it to sit for a specified time, and vacuum the area. What each of the above tips have in common is that they may or may not be effective while still costing you time and money. It could be a better use of both resources to contact Companion Maids for a one-time cleaning session. We use strong, professional-grade cleaning supplies that you probably don’t have access to as a consumer. We have also made a significant investment in heavy-duty cleaning equipment such as wet/dry vacuum cleaners. The likelihood of getting a blood stain out of your furniture or carpet is much higher when you work with us. Companion Maids also offers laundry services as an add-on to regular cleaning sessions. Whether you have concerns about set-in stains or not, the best way to prevent your home from becoming dirty and cluttered is to arrange for regular maid service. For your convenience, we offer cleaning packages every seven, 14, or 28 days. We welcome you to call our office in Chicago at 773-346-6714 to learn more about how we can clean your home and reduce the stress in your life. You can also request services by completing this form.